- FDA approved 100% food grade silicone and BPA free eco-friendly Ozera silicone muffin pan, silicone kitchenware is a trend for both home and professional kitchenware nowadays. - Ozera muffin pans and cupcake makers are non-stick and easy to clean. The pans will work with a variety of sticky foods, including melted cheese and dough, muffins and tarts are cinch. Many customers have found creative ways to use it like cupcakes, muffins, brownies, cookies, cheesecakes, quiches, breads, chocolates, candies, tarts, butters, caramels, ice cubes, frozen baby foods, gelatin, ice creams etc. - Heat resistant to 450℉, microwave, oven, refrigerator, freezer are all safe. 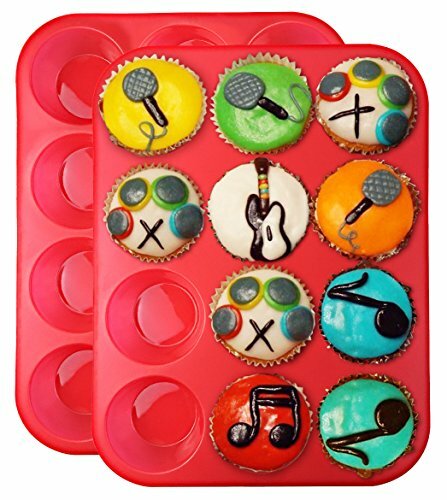 - High quality and high availability, Ozera silicone muffin pan is a perfect gift for any occasion: birthdays, anniversaries, Christmas, Mothers' Day and more. - Please clean after use and put it avoid direct sunlight. - Put the cap back in place and ensure it is on tight after use and keep it out the reach of kids. Ozera highly appreciates all customers' opinions to improve the selling ,also if anything you unsatisfied, pls contact our customer service department for probable best solution. Our promise to you: Customers are our top priority, which is why kitchen buddies offers a lifetime replacement guarantee, so you can be positive you are receiving the highest quality products! Click the "Add to Cart" button now to make us a buddy in your kitchen. OZERA silicone muffin pans are made from high quality 100% food grade silicone and are FDA approved and BPA free; microwave, freezer and dishwasher safe and heat resistant to 450F, they are made to last a lifetime. Standard muffin cup is about 2 1/2 inches in diameter and holds 1/4 to 1/3 cup batter.12 cup muffin pan, set of 2. OZERA brightly colored muffin pan will fit perfectly in your oven. To use it you simply have to place the pan on a cookie sheet, fill and bake in a proper way, or you can simply place them directly on a regular cookie sheet. With our pan, there is no need for sticky cooking spray or messy wrappers, just pop them and they are ready to go! OZERA stain-resistant, FDA food grade silicone muffin pan are completely dishwasher safe so cleaning is always quick, simple, and worry-free! Alternatively simply cleaning with hot soapy water does the job! Once cleaned simply fold the muffin into a storage space until next use, the flexibility of silicone allows the pan to be folded without damage, it simply unfolds back to its initial shape. OZERA silicone baking pans are not just for muffin; they can also be used for cupcakes, chocolate coffee smoothies, mini lasagna cups, baked oatmeal cups, chicken pot pie cups and so much more. Muffins release easily from pan by pressing on the base and popping them out. No more unsightly ruined muffins and cupcakes to embarrass you in front of company. No more using elbow grease to scrub off encrusted cake. OZERA 100% MONEY BACK GUARANTEE! We take pride in delivering top quality products and guarantee a FULL refund if you are not satisfied with our products. Lifetime warranty for any issues and our complete customer service gives you comfortable purchase experience. TOTALLY RISK FREE, buy with confidence now. If you have any questions about this product by Ozera, contact us by completing and submitting the form below. If you are looking for a specif part number, please include it with your message.